1:1 From Paul, 1 an apostle of Christ Jesus by the will of God, to the saints [in Ephesus], 2 the faithful 3 in Christ Jesus. 1:2 Grace and peace to you 4 from God our Father and the Lord Jesus Christ! 1:3 Blessed 5 is 6 the God and Father of our Lord Jesus Christ, who has blessed 7 us with every spiritual blessing in the heavenly realms in Christ. 1:4 For 8 he chose us in Christ 9 before the foundation of the world that we may be holy and unblemished 10 in his sight 11 in love. 12 1:5 He did this by predestining 13 us to adoption as his 14 sons 15 through Jesus Christ, according to the pleasure 16 of his will – 1:6 to the praise of the glory of his grace 17 that he has freely bestowed on us in his dearly loved Son. 18 1:7 In him 19 we have redemption through his blood, 20 the forgiveness of our trespasses, according to the riches of his grace 1:8 that he lavished on us in all wisdom and insight. 1:9 He did this when he revealed 21 to us the secret 22 of his will, according to his good pleasure that he set forth 23 in Christ, 24 1:10 toward the administration of the fullness of the times, to head up 25 all things in Christ – the things in heaven 26 and the things on earth. 27 1:11 In Christ 28 we too have been claimed as God’s own possession, 29 since we were predestined according to the one purpose of him who accomplishes all things according to the counsel of his will 1:12 so that we, who were the first to set our hope 30 on Christ, 31 would be to the praise of his glory. 1:13 And when 32 you heard the word of truth (the gospel of your salvation) – when you believed in Christ 33 – you were marked with the seal 34 of the promised Holy Spirit, 35 1:14 who is the down payment 36 of our inheritance, until the redemption of God’s own possession, 37 to the praise of his glory. 2 tc The earliest and most important mss omit “in Ephesus” (Ì46 א* B* 6 1739 [McionT,E]), yet the opening line of this epistle makes little sense without the phrase (“to the saints who are and are faithful…”? or perhaps “to the saints who are also faithful,” though with this sense the οὖσιν [ousin] is redundant and the καί [kai] is treated somewhat unnaturally). What is interesting is Marcion’s canon list which speaks of the letter to the Laodiceans among Paul’s authentic epistles. This, coupled with some internal evidence that the writer did not know his audience personally (cf. 1:15; 3:2; absence of personal names throughout), suggests that Ephesians was an encyclical letter, intended for more than one audience. Does this mean that the shorter reading is to be preferred? Yes and no. A plausible scenario is as follows, assuming Pauline authorship (though this is strongly contested today; for arguments on behalf of Pauline authorship, see M. Barth, Ephesians [AB 34], 1:36-50; P. T. O’Brien, Ephesians, 4-47; and H. W. Hoehner, Ephesians, 2-61): Paul sent the letter from Rome, intending it first to go to Ephesus. At the same time, Colossians was dispatched. 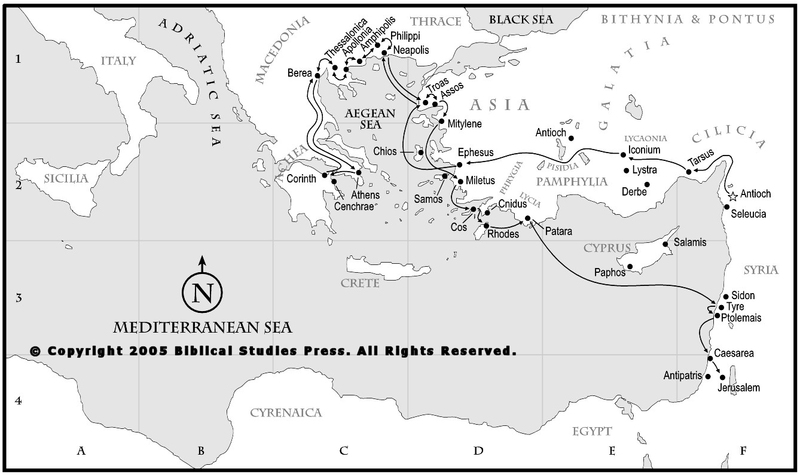 Going counterclockwise through Asia Minor, this letter would first come to Ephesus, the port of entry, then to Laodicea, then Colossae. Tychicus’ instructions may well have been for each church to “fill in the blank” on the address line. The church at Ephesus would have certainly made the most copies, being Paul’s home base for nearly three years. Hence, most of the surviving copies have “in Ephesus” in v. 1 (so א2 A B2 D F G Ψ 0278 33 1881 Ï latt sy co). But one might expect a hint of evidence that Laodicea also made a few copies: Both Marcion’s list and Col 4:16 may well imply this. What is to account for the early Alexandrian evidence, then? These mss were perhaps made from a very early copy, one reflecting the blank line before each church filled it in. 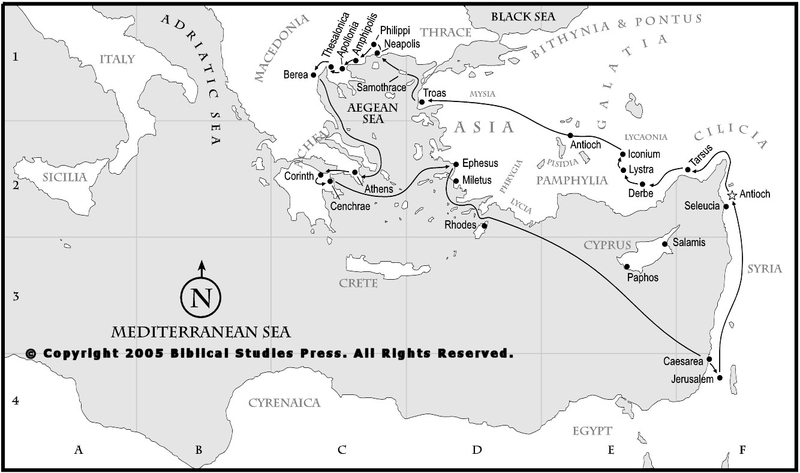 Although it is of course only speculation (as is necessary in a historical investigation lacking some of the pieces to the puzzle), this scenario accounts for all of the data: (1) “in Ephesus” in most mss; (2) Laodicea in Marcion’s list and Col 4:16; (3) the lack of an addressee in the earliest witnesses; (4) why the earliest witnesses’ reading must be rejected as too hard; and (5) why the author seems not to know the readership. In sum, is “in Ephesus” original? Yes and no. Some address belongs there; ἐν ᾿Εφέσῳ (en Efesw) is the predominant address, but several other churches also received this circular letter as their own. For this reason the phrase has been placed in single brackets in the translation. NA27 also lists the words in brackets, indicating doubt as to their authenticity. map For location see JP1-D2; JP2-D2; JP3-D2; JP4-D2. 3 tn Grk “and faithful.” The construction in Greek (as well as Paul’s style [and even if this letter is not by Paul it follows the general style of Paul’s letters, with some modifications]) suggests that the saints are identical to the faithful; hence, the καί (kai) is best left untranslated. See M. Barth, Ephesians (AB 34), 1:68 and ExSyn 282. 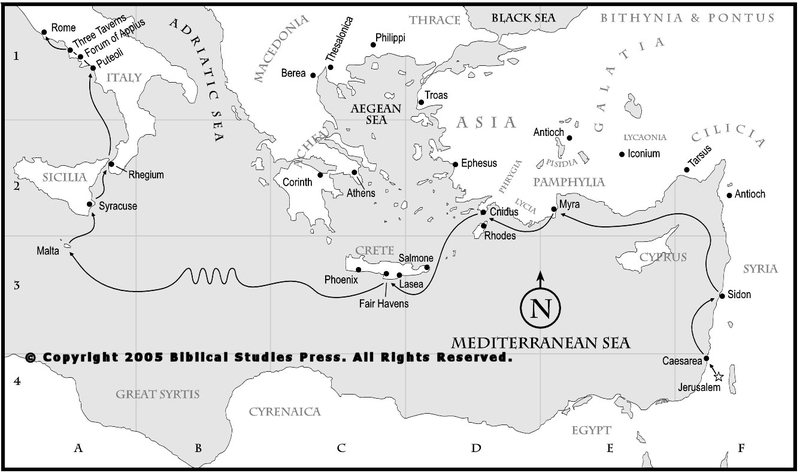 5 sn Eph 1:3-14 comprises one long sentence in Greek, with three major sections. Each section ends with a note of praise for God (vv. 6, 12, 14), focusing on a different member of the Trinity. After an opening summary of all the saints’ spiritual blessings (v. 3), the first section (vv. 4-6) offers up praise that the Father has chosen us in eternity past; the second section (vv. 7-12) offers up praise that the Son has redeemed us in the historical past (i.e., at the cross); the third section (vv. 13-14) offers up praise that the Holy Spirit has sealed us in our personal past, at the point of conversion. 6 tn There is no verb in the Greek text; either the optative (“be”) or the indicative (“is”) can be supplied. The meaning of the term εὐλογητός (euloghtos), the author’s intention at this point in the epistle, and the literary genre of this material must all come into play to determine which is the preferred nuance. εὐλογητός as an adjective can mean either that one is praised or that one is blessed, that is, in a place of favor and benefit. The meaning “blessed” would be more naturally paired with an indicative verb here and would suggest that blessedness is an intrinsic part of God’s character. The meaning “praised” would be more naturally paired with an optative verb here and would suggest that God ought to be praised. Pauline style in the epistles generally moves from statements to obligations, expressing the reality first and then the believer’s necessary response, which would favor the indicative. However, many scholars regard Eph 1:3-14 as a berakah psalm (cf. A. T. Lincoln, Ephesians [WBC], 10-11). Rooted in the OT and Jewish worship, berakah psalms were songs of praise in which the worshiper gave praise to God; this would favor the optative (although not all scholars are agreed on this genre classification here; see H. W. Hoehner, Ephesians, 153-59, for discussion and an alternate conclusion). When considered as a whole, although a decision is difficult, the indicative seems to fit all the factors better. The author seems to be pointing to who God is and what he has done for believers in this section; the indicative more naturally fits that emphasis. Cf. also 2 Cor 1:3; 1 Pet 1:3. 8 tn Grk “just as.” Eph 1:3-14 are one long sentence in Greek that must be broken up in English translation. Verse 4 expresses the reason why God the Father is blessed (cf. BDAG 494 s.v. καθώς 3). 10 sn The Greek word translated unblemished (ἀμώμους, amwmous) is often used of an acceptable paschal lamb. Christ, as our paschal lamb, is also said to be unblemished (Heb 9:14; 1 Pet 1:19). Since believers are in Christ, God views them positionally and will make them ultimately without blemish as well (Jude 24; Eph 5:27; Col 1:22). 12 tn The prepositional phrase ἐν ἀγάπῃ (en agaph, “in love”) may modify one of three words or phrases: (1) “chose,” (2) “holy and unblemished,” both in v. 4, or (3) “by predestining” in v. 5. If it modifies “chose,” it refers to God’s motivation in that election, but this option is unlikely because of the placement of the prepositional phrase far away from the verb. The other two options are more likely. If it modifies “holy and unblemished,” it specifies that our holiness cannot be divorced from love. This view is in keeping with the author’s use of ἀγάπη to refer often to human love in Ephesians, but the placement of the prepositional phrase not immediately following the words it modifies would be slightly awkward. If it modifies “by predestining” (v. 5), again the motivation of God’s choice is love. This would fit the focus of the passage on God’s gracious actions toward believers, but it could be considered slightly redundant in that God’s predestination itself proves his love. 13 tn Grk “by predestining.” Verse 5 begins with an aorist participle dependent on the main verb in v. 4 (“chose”). sn By predestining. The aorist participle may be translated either causally (“because he predestined,” “having predestined”) or instrumentally (“by predestining”). A causal nuance would suggest that God’s predestination of certain individuals prompted his choice of them. An instrumental nuance would suggest that the means by which God’s choice was accomplished was by predestination. The instrumental view is somewhat more likely in light of normal Greek syntax (i.e., an aorist participle following an aorist main verb is more likely to be instrumental than causal). sn Adoption as his sons is different from spiritual birth as children. All true believers have been born as children of God and will be adopted as sons of God. The adoption is both a future reality, and in some sense, already true. To be adopted as a son means to have the full rights of an heir. Thus, although in the ancient world, only boys could be adopted as sons, in God’s family all children – both male and female – are adopted. 17 tn Or “to the praise of his glorious grace.” Many translations translate δόξης τῆς χάριτος αὐτοῦ (doxh" th" carito" autou, literally “of the glory of his grace”) with τῆς χάριτος as an attributed genitive (cf., e.g., NIV, NRSV, ESV). The translation above has retained a literal rendering in order to make clear the relationship of this phrase to the other two similar phrases in v. 12 and 14, which affect the way one divides the material in the passage. 18 tn Grk “the beloved.” The term ἠγαπημένῳ (hgaphmenw) means “beloved,” but often bears connotations of “only beloved” in an exclusive sense. “His dearly loved Son” picks up this connotation. sn God’s grace can be poured out on believers only because of what Christ has done for them. Hence, he bestows his grace on us because we are in his dearly loved Son. 19 tn Grk “in whom” (the relative clause of v. 7 is subordinate to v. 6). The “him” refers to Christ. 20 sn In this context his blood, the blood of Jesus Christ, refers to the price paid for believers’ redemption, which is the sacrificial death of Christ on the cross. 21 tn Or “He did this by revealing”; Grk “making known, revealing.” Verse 9 begins with a participle dependent on “lavished” in v. 8; the adverbial participle could be understood as temporal (“when he revealed”), which would be contemporaneous to the action of the finite verb “lavished,” or as means (“by revealing”). The participle has been translated here with the temporal nuance to allow for means to also be a possible interpretation. If the translation focused instead upon means, the temporal nuance would be lost as the time frame for the action of the participle would become indistinct. 22 tn Or “mystery.” In the NT μυστήριον (musthrion) refers to a divine secret previously undisclosed. 23 tn Or “purposed,” “publicly displayed.” Cf. Rom 3:25. 24 tn Grk “in him”; the referent (Christ) has been specified in the translation for the sake of clarity. sn In Christ. KJV has “in himself” as though the antecedent were God the Father. Although possible, the notion of the verb set forth (Greek προτίθημι, protiqhmi) implies a plan that is carried out in history (cf. Rom 1:13; 3:25) and thus more likely refers to Christ. 25 tn The precise meaning of the infinitive ἀνακεφαλαιώσασθαι (anakefalaiwsasqai) in v. 10 is difficult to determine since it was used relatively infrequently in Greek literature and only twice in the NT (here and Rom 13:9). While there have been several suggestions, three deserve mention: (1) “To sum up.” In Rom 13:9, using the same term, the author there says that the law may be “summarized in one command, to love your neighbor as yourself.” The idea then in Eph 1:10 would be that all things in heaven and on earth can be summed up and made sense out of in relation to Christ. (2) “To renew.” If this is the nuance of the verb then all things in heaven and earth, after their plunge into sin and ruin, are renewed by the coming of Christ and his redemption. (3) “To head up.” In this translation the idea is that Christ, in the fullness of the times, has been exalted so as to be appointed as the ruler (i.e., “head”) over all things in heaven and earth (including the church). That this is perhaps the best understanding of the verb is evidenced by the repeated theme of Christ’s exaltation and reign in Ephesians and by the connection to the κεφαλή- (kefalh-) language of 1:22 (cf. Schlier, TDNT 3:682; L&N 63.8; M. Barth, Ephesians [AB 34], 1:89-92; contra A. T. Lincoln, Ephesians [WBC], 32-33). 28 tn Grk “in whom,” as a continuation of the previous verse. 29 tn Grk “we were appointed by lot.” The notion of the verb κληρόω (klhrow) in the OT was to “appoint a portion by lot” (the more frequent cognate verb κληρονομέω [klhronomew] meant “obtain a portion by lot”). In the passive, as here, the idea is that “we were appointed [as a portion] by lot” (BDAG 548 s.v. κληρόω 1). The words “God’s own” have been supplied in the translation to clarify this sense of the verb. An alternative interpretation is that believers receive a portion as an inheritance: “In Christ we too have been appointed a portion of the inheritance.” See H. W. Hoehner, Ephesians, 226-27, for discussion on this interpretive issue. sn God’s own possession. Although God is not mentioned explicitly in the Greek text, it is clear from the context that he has chosen believers for himself. Just as with the nation Israel, the church is God’s chosen portion or possession (cf. Deut 32:8-9). 32 tn Grk “in whom you also, when…” (continuing the sentence from v. 12). 33 tn Grk “in whom also having believed.” The relative pronoun “whom” has been replaced in the translation with its antecedent (“Christ”) to improve the clarity. 35 tn Grk “the Holy Spirit of promise.” Here ἐπαγγελίας (epangelias, “of promise”) has been translated as an attributive genitive. sn Down payment. The Greek word ἀρραβών (arrabwn) denotes the first payment or first installment of money or goods which serves as a guarantee or pledge for the completion of the transaction. In the NT the term is used only figuratively of the Holy Spirit as the down payment of the blessings promised by God (it is used also in 2 Cor 1:22 and 5:5). In the “already – not yet” scheme of the NT the possession of the Spirit now by believers (“already”) can be viewed as a guarantee that God will give them the balance of the promised blessings in the future (“not yet”). 38 sn The conjunctive phrase For this reason points back to the preceding section, vv. 3-14, which is also summed up in this verse in the expression because I have heard of your faith. In other words, the author’s prayer can be made for his audience because he knows that they are true believers. 41 tc Ì46 א* A B P 33 1739 1881 2464 Hier lack “your love” (τὴν ἀγάπην, thn agaphn), while various other groups of mss have different arrangements of the phrase “your love toward all the saints” (τὴν ἀγάπην τὴν εἰς πάντας τοὺς ἁγίους, thn agaphn thn ei" panta" tou" Jagiou"). Most witnesses, especially the later ones (א2 D1 Ψ Ï latt sa), read τὴν ἀγάπην τὴν εἰς πάντας τοὺς ἁγίους. Externally, the shorter reading is superior. Internally, the omission of τὴν ἀγάπην is a significantly harder reading, for the saints become an object of faith on par with the Lord Jesus. If this reading is authentic, however, the force of πίστις (pisti") is probably closer to “faithfulness,” a meaning that could perhaps be suitable toward both the Lord and the saints. Nevertheless, if the shorter reading is authentic, later scribes would no doubt have been tempted to alter it. With the parallel in Col 1:4 at hand, τὴν ἀγάπην would have been the most obvious phrase to add. (TCGNT 533 suggests that ἣν ἔχετε would have been added instead of the second τήν if the shorter reading were original, in conformity with Col 1:4, but this is not necessarily so: Scribes often altered the text as minimally as possible, and since the second τήν was already present, replacing it with ἣν ἔχετε, when the meaning was not significantly different from the second τήν, seems unlikely.) Further, ἀγάπην comes after “saints” (thus, τὴν εἰς πάντας τοὺς ἁγίους ἀγάπην) in some witnesses (81 104 326 365 1175), and the second τήν is lacking (thus, τὴν ἀγάπην εἰς πάντας τοὺς ἁγίους) in others (D* F G). Such a floating text normally indicates inauthenticity. On the other hand, τὴν ἀγάπην could easily have dropped out of the text by way of haplography, the Alexandrian scribes’ eyes skipping from τήν to τήν. The weak first declension feminine article-noun-article construction is common enough in the NT, occurring over 40 times, yet in four of these texts there is some ms evidence for an omission similar to Eph 1:15 (Rom 11:17; 2 Tim 3:10; Rev 11:2; 21:9). But in none of these places is the Alexandrian testimony united in the omission as it is here. 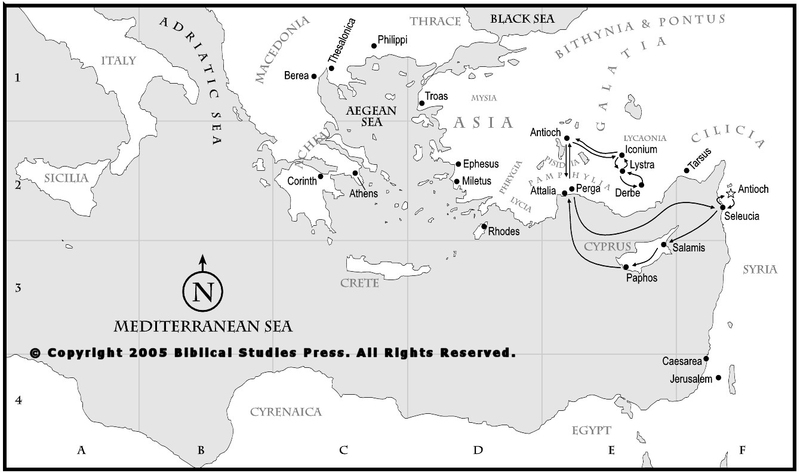 Further, a wholesale Alexandrian omission of τὴν ἀγάπην presupposes a much stronger genealogical relation among the Alexandrian mss than many scholars would embrace. What seems to tip the scales in favor of the longer reading, however, is the intrinsic evidence: The question of whether πίστις could be used to mean faithfulness in the general sense toward both the Lord and the saints is quite problematic. All in all, a decision is difficult, but the longer reading is, with hesitation, preferred. 43 tn The words “I pray” are not in the Greek text, but have been supplied to clarify the meaning; v. 17 is a subordinate clause to v. 16 (“I pray” in v. 17 is implied from v. 16). Eph 1:15-23 constitutes one sentence in Greek, but a new sentence was started here in the translation in light of contemporary English usage. 45 tn Or “the Spirit of wisdom and revelation,” or “a spirit of wisdom and revelation.” Verse 17 involves a complex exegetical problem revolving around the Greek term πνεῦμα (pneuma). Some take it to mean “the Spirit,” others “a spirit,” and still others “spiritual.” (1) If “the Spirit” is meant, the idea must be a metonymy of cause for effect, because the author had just indicated in vv. 13-14 that the Spirit was already given (hence, there is no need for him to pray that he be given again). But the effect of the Spirit is wisdom and revelation. (2) If “a spirit” is meant, the idea may be that the readers will have the ability to gain wisdom and insight as they read Paul’s letters, but the exact meaning of “a spirit” remains ambiguous. (3) To take the genitives following πνεῦμα as attributed genitives (see ExSyn 89-91), in which the head noun (“S/spirit”) functions semantically like an adjective (“spiritual”) is both grammatically probable and exegetically consistent. sn The point of the knowledge of him has nothing to do with what God knows, but with what believers are to know (hence, “your…knowledge”). Further, the author’s prayer is that this knowledge of God would increase, not simply be initiated, since he is writing to believers who already know God (hence, “your growing knowledge of him”). 47 tc ‡ Most witnesses, especially of the Byzantine and Western texttypes, though with a few important Alexandrian witnesses (א A D F G Ψ 0278 Ï latt sy), add ὑμῶν (Jumwn, “your”) after καρδίας (kardias, “heart”), though it is clearly implied in the shorter (Alexandrian) reading (found in Ì46 B 6 33 1175 1739 1881 pc). The longer reading thus looks to be a clarifying gloss, as is frequently found in the Byzantine and Western traditions. The translation above also uses “your” because of English requirements, not because of textual basis. 48 tn The perfect participle πεφωτισμένους (pefwtismenou") may either be part of the prayer (“that the eyes of your heart may be enlightened”) or part of the basis of the prayer (“since the eyes of your heart have been enlightened”). Although the participle follows the ἵνα (Jina) of v. 17, it is awkward grammatically in the clause. Further, perfect adverbial participles are usually causal in NT Greek. Finally, the context both here and throughout Ephesians seems to emphasize the motif of light as a property belonging to believers. Thus, it seems that the author is saying, “I know that you are saved, that you have had the blinders of the devil removed; because of this, I can now pray that you will fully understand and see the light of God’s glorious revelation.” Hence, the translation takes the participle to form a part of the basis for the prayer. sn The hope of his calling. The translation is more formally equivalent for this and the following two phrases, because of the apparently intentional literary force of the original. There is a natural cadence to the three genitive expressions (hope of his calling, wealth of his glorious inheritance, and extraordinary greatness of his power). The essence of the prayer is seen here. Paraphrased it reads as follows: “Since you are enlightened by God’s Spirit, I pray that you may comprehend the hope to which he has called you, the spiritual riches that await the saints in glory, and the spiritual power that is available to the saints now.” Thus, the prayer focuses on all three temporal aspects of our salvation as these are embedded in the genitives – the past (calling), the future (inheritance), and the present (power toward us who believe). sn What has been translated as exercise is a term used only of supernatural power in the NT, ἐνέργεια (energeia). 55 tn Grk “which” (v. 20 is a subordinate clause to v. 19). 56 tn The verb “exercised” (the aorist of ἐνεργέω, energew) has its nominal cognate in “exercise” in v. 19 (ἐνέργεια, energeia). 57 tn Or “This power he exercised in Christ by raising him”; Grk “raising him.” The adverbial participle ἐγείρας (egeiras) could be understood as temporal (“when he raised [him]”), which would be contemporaneous to the action of the finite verb “he exercised” earlier in the verse, or as means (“by raising [him]”). The participle has been translated here with the temporal nuance to allow for means to also be a possible interpretation. If the translation focused instead upon means, the temporal nuance would be lost as the time frame for the action of the participle would become indistinct. 58 tc The majority of mss, especially the Western and Byzantine mss (D F G Ψ Ï b r Ambst), have the indicative ἐκάθισεν (ekaqisen, “he seated”) for καθίσας (kaqisa", “when he seated, by seating”). The indicative is thus coordinate with ἐνήργησεν (enhrghsen, “he exercised”) and provides an additional statement to “he exercised his power.” The participle (found in Ì92vid א A B 0278 33 81 1175 1505 1739 1881 2464 al), on the other hand, is coordinate with ἐγείρας (egeiras) and as such provides evidence of God’s power: He exercised his power by raising Christ from the dead and by seating him at his right hand. As intriguing as the indicative reading is, it is most likely an intentional alteration of the original wording, accomplished by an early “Western” scribe, which made its way in the Byzantine text. 59 sn Eph 1:19-20. The point made in these verses is that the power required to live a life pleasing to God is the same power that raised Christ from the dead. For a similar thought, cf. John 15:1-11. 60 tn Grk “he”; the referent (God) has been specified in the translation for clarity. 62 tn Grk “his”; the referent (Christ) has been specified in the translation for clarity. 63 sn An allusion to Ps 8:6. 65 tn Grk “which is.” The antecedent of “which” is easily lost in English, though in Greek it is quite clear. In the translation “church” is repeated to clarify the referent. sn The idea of all in all is either related to the universe (hence, he fills the whole universe entirely) or the church universal (hence, Christ fills the church entirely with his presence and power).